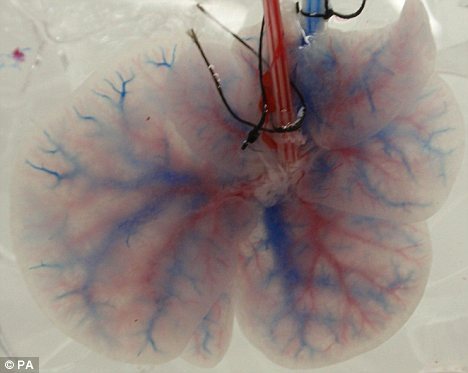 Scientists have grown a liver in a laboratory, offering fresh hope to hundreds of thousands of patients with diseased and damaged organs. It raises the prospect of those in need of transplants one day being offered livers that are ‘made to order’. The first pieces of lab-grown livers could be used in hospitals within just five years, the researchers said. Patches of artificial tissue could be used to repair livers damaged by injury, disease, alcohol abuse and paracetamol overdose. Other possibilities include sections of artificial livers to keep those needing transplants alive – in much the same way as a dialysis machine is used to treat kidney failure. 1. Donated but damaged liver bathed in detergent to remove the cells. 2. All that remains is a 'scaffold' made of collagen and blood vessels. 3. Scaffold is seeded with healthy liver cells, made from the stem cells created from the patient's skin. 4. The new liver is used to replace the patient's damaged one. As it is made from their own cells, the body will not reject it. At least one million of Britons live with liver disease and it claims more than 16,000 lives a year – more than diabetes and traffic accidents combined. Up to 600 transplants are carried out a year. The latest experiments, which were carried out on animal livers, are still in the early stages but could one day lead to an alternative supply of organs. The process began with a donor liver being ‘washed’ in detergent, stripping it of its cells, leaving only a collagen and blood vessel ‘scaffold’ in which the new liver cells could grow. The U.S. scientists then injected it with up to 200 million healthy liver cells, in four shots, each ten minutes apart. The cells spread across the scaffold, and, provided with an artificial blood supply, the liver survived in a petri dish for up to ten days, the journal Nature Medicine reports. Tests showed that, just like a real liver, it was capable of breaking up toxins. The researchers, from Massachusetts General Hospital, Boston, also transplanted the liver into a rat, for several hours. Lead researcher Dr Korkut Uygun said: ‘As far as we know, a transplantable liver graft has never been constructed in a laboratory setting before. ‘Even though this is very exciting and promising, it is a proof-of-concept study only. Much more work will be required to make long-term functional liver grafts that can actually be transplanted into humans. Hurdles to overcome include creating a liver with all the types of cells needed for full function, including specialised cells that destroy bacteria and other invaders.